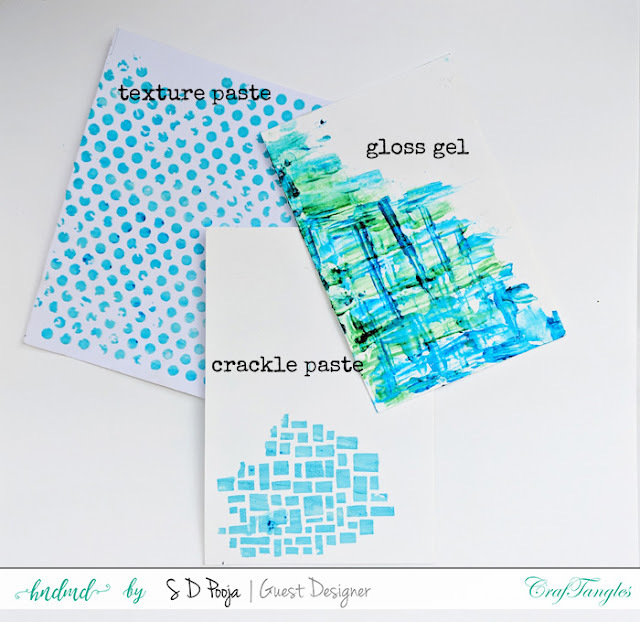 We can easily create custom colored mixed media pastes using these liquid watercolors. Being very concentrated we have to be very careful with the amount of color to be used. I have mixed PoolSide Liquid watercolor with Texture paste, Crackle paste and for gloss gel I added limelight. As you can see with gloss gel the colors look even more vibrant. Later I reduced the amount of color to get a bit lighter color with texture paste and crackle paste. This is the most popular technique used with watercolors. It’s the easiest way to color images as the embossed lines act as boundaries and we don’t have to worry about color going outside lines. Just drop the colors and get artsy look in no time. 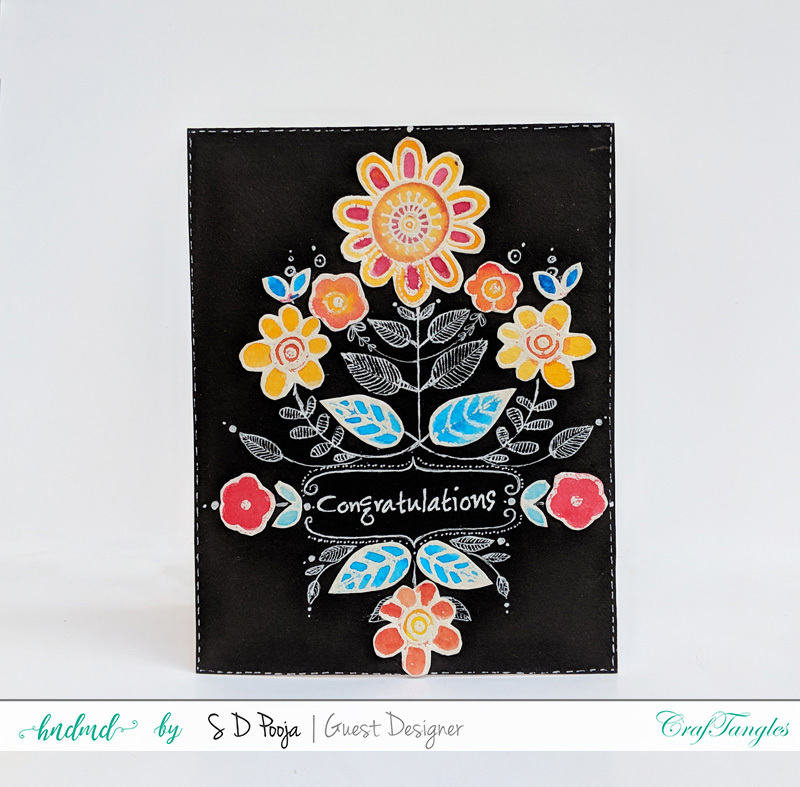 This card was inspired by Folk art painting. I white heat embossed flowers and leaves from Doodle Flowers Stamp set (from Janes Doodle’s) fussy cut them and adhered on the card panel. I drew few additional details with white gel pens. Ombre is gradual blending of one color hue to another. It can be achieved by diluting the color with water for lighter hues. For these cards I painted two Ombre bg with Poolside and Soulmate. The letter U was hand-cut from both of them and clear heat embossed to get glossy look. Can you guess what I have used for the bg? Raindrops stencil to create exclamation marks (don’t tell me they look like drops ;) ) ! Background strips made using Poolside and Limelight liquid watercolors. Can you tell how much I love the Soulmate liquid watercolor? I made entire card using just this color. I random brush strokes in the bg followed by gold embossing. How do you like the techniques and cards shared today ? Would love to know if you a favorite to use watercolors. With you, I never assume anything to be other than Handmades!! Absolutely love the ideas and the way you shared your reviews with lovely techniques...That handcut die-cuts are simply superb! Love all the cards ...but the last one loots my heart for the soothing tones and the pop of gold with vellum touch!!! These are stunning Pooja. I loved every technique used.